Samsung Electronics Indonesia (SEIN) is an electronic manufacture from South Korea, and has existed in Indonesia since 25 years ago. In a world, Samsung becoming the most popular brand for smartphone. Everyone know about how great Samsung smartphone including here in Indonesia. But now, SEIN want Indonesian public not only know about how greatness their Smartphone, but also their printer by cooperate with Next Digital Indonesia and market it into digital. We do not want to be rush ? because we know, Samsung always identically with Smartphone even wherever you go. So, we have to face this public ?viewpoint? and try to change it. We want Indonesian know that everytime someone say Samsung, he immediately reffered to ?Smartphone?, and ?printer?. That?s a hard work! We start from learning consumer behavior first, and also a company needs for printer. 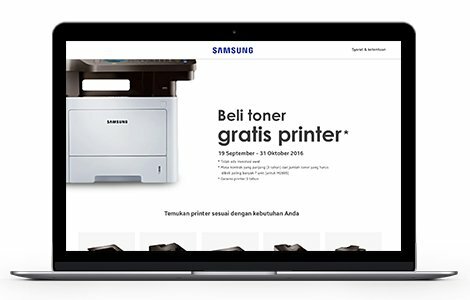 Afterwards, we try to make an conclusion and decided to create a unique microsite to promote Samsung IPP with an exclusive offer, ?beli toner gratis printer?. The microsite also designed with very atrractive by Next Digital Indonesia team, to giving the best consumer experience for any information about Samsung Printer.